Our Club grew by one! Welcome to Bill Poirier!! Jacky welcomed the Club to our first meeting of the new year! Thank you to Laura for incredible banners! Officially no more Thursday evening meetings as decided during Visioning process. We will be focusing on social/service activities instead. Keep your eye out for emails through Club Runner or check website. Send ideas along to Jacky! Foundation (Rich) – Funds come from our dues and foundation gifts. The foundation fund is large but always needs to be replenished. 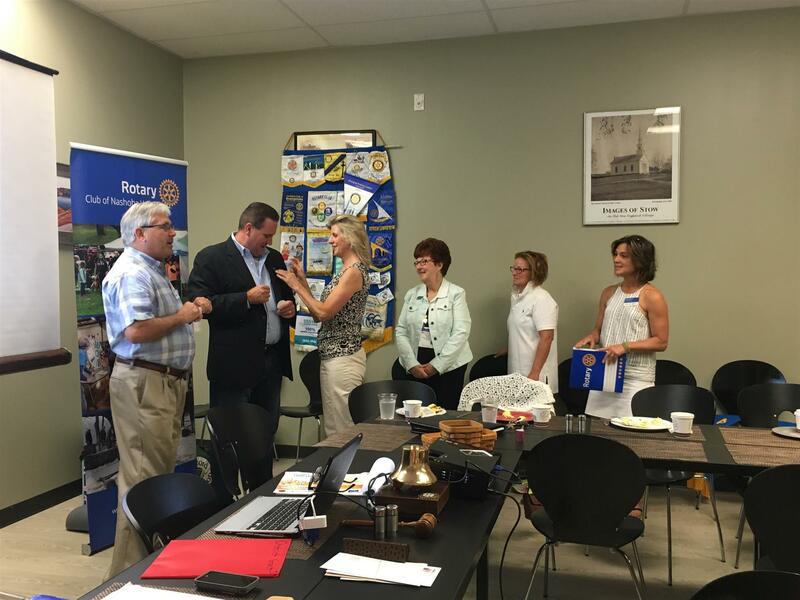 Membership – Howard shared that recruiting from other clubs was a focus in a recent Rotary magazine. Florence, who is originally from Uganda, came to the United States in 2000 to be married. She joined us this morning to share her vision and commitment to education. In 1980, Florence went on to high school were her mind burst open. There was no money for college but everywhere, she looked at how girls were treated. When Florence’s husband died, she was left with a 5-year old son to care for on her own. Her in-laws invited her to marry another one of their sons, but she refused and ran away to Nairobe. From there, she met an American man, whose wife Florence stayed in touch with. When his wife died in America, he contacted her knowing they had stayed in touch. He brought her to America where they have now been married for 20 years. Florence’s dream of education has stayed with her. In Uganda, college is only for the rich or those who work in the Government. Getting a job is also difficult unless you know a business owner or are married to one. Without college and a job, many children turn to the streets. Florence shared her work ethic which funded her nieces & nephews to be sent to Catholoc boarding school. After watching them turn their lives around, she secretly helped to house 22 children and sent them to school too! Since her work to raise money to educate girls and boys Uganda, many have gone onto American colleges or received grants to attend college in their home country. She has now done his for 72 students!! The question, how much does it cost for school: $400/semester (3 semesters). Some families make only $300/month. Watch Florence’s presentation on our Facebook page. Thank you to Steve for recording it.